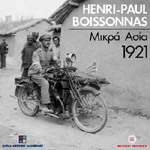 The book ?Henri-Paul Boissonnas: Asia Minor 1921? includes approximately 300 photographs, their majority unpublished, as well as several water-coloured paintings, since Boissonnas was also a painter. In 1921 Henri-Paul Boissonnas, the descendant of a Swiss family of Greek-loving photographers, traveled to Asia Minor in order to record the Greek campaign, which at the time resembled a heroic epic, taking photographs as the representative of the Journal de Gen?ve. At the same time, Boissonnas recorded the everyday life of Greeks and Turks, as well as the landscapes and monuments he encountered in his travels. Almost 80 years later, the photographer's archive was donated to the Benaki Museum and jointly with the Foundation of the Hellenic World they published this valuable and extremely interesting material. The book also includes the letters he sent to his fianc?e and his parents, part of his journal and relevant documents. Furthermore, the importance of this album is evident, since it is accompanied by articles that enlighten and interpret the general historical framework of the era, the Boissonnas family, his "photographic" perspective, but also the history of the archive. This attractive publication has been jointly produced by the Foundation of the Hellenic World and the Benaki Museum, on the occasion of the 80th anniversary of the Asia Minor Catastrophe and provides an unusual but penetrative look into the events that changed the course of Hellenism in the beginning of the previous century.